Would you like to win a prize? Would you like to support 2 great causes? If the answer to either of these questions is "YES" then why not enter the first ever Run Geordie Run T-Shirt photo Competition. "How do I enter?" I hear you say. It's simple really and remember it's all for a good cause; St Benedict's Hospice and The Children's Foundation! a) Buy a Run Geordie Run T-Shirt for £10. Payment can be made by cheque or via the www.justgiving.com links on the right of this page. Remember, the full £10 goes to charity. Yes, the full £10! That is possible all thanks to Peter McCowie and our friends at customplanet.co.uk. b) Drop me a line at sponsorship@rungeordierun.com with details of where you would like the t-shirt posting and what size you would like. c) Then all you have to do is go on holiday or do something dangerous or unusual and get your photo taken wearing the t-shirt. d) Send your photo to sponsorship@rungeordierun.com and on September 10th the most deserving photo will be judged by a panel of experts and the winner informed thereafter. Thanks in advance and please remember the full £10 you pay goes to the 2 charities. The t-shirts are screen printed for superior quality with details of the USA run on the front and back. Most importantly of all the back of the t-shirt says "I'm supporting the 3100 mile run across the USA...". And by buying a t-shirt for £10 you certainly are supporting not only the run but 2 very important and worthwhile charities. Wednesday 27th May 2009 - Personal Training Session. (01:30:00). Friday 29th May 2009 - 59 mile bike ride, Gosforth to Bamburgh. (04:57:49). Saturday 30th May 2009 -61 mile bike ride, Bamburgh to Gosforth. (05:44:51). I don't intend to review every week of training but I think last week is particularly worthy of mention. The planned mileage was 85 which was a little tricky in itself given that I'm preparing for the Blaydon Race with lots of short sharp runs. As a result, the 85 miles were spread over 14 sessions. Please bear with me, on this one, there is a lot of maths in this post. You may get a bit lost off but stick with it and I'm sure you'll see the point at the end. The first 10 sessions in week 29 had very little impact on my body and I was always able to recover well enough to tackle the next run with few aches and pains. The final 4, however, were a different story. I could hardly move during session 11 on Friday morning. It was just a 4 mile run on the treadmill! The first mile took over 10 minutes to complete and the second wasn't that much quicker. I really had to dig deep to get a final time of 00:38:39 and give myself a chance of beating the previous best overall pace per mile of 00:09:20. That was set back in March 2009 on a week where I ran 70 miles over 10 sessions. Session 12 on Friday lunchtime was also very tough. Going into this session I realised that I still had 22.5 miles left to do for the week. 11.2 of those were already earmarked for Saturday. That left 11.3 to complete over the final 2 sessions on Friday. Session 12 was quite slow again with 5.5 miles being done in 00:52:26 (00:09:32 per mile). Session 13 was done only 4 hours later but the difference in pace really surprised me. I had a really good stretch beforehand and set off for 5.8 miles. The first mile was done in 00:09:10 and each mile thereafter got little bit quicker. The total time taken was 00:48:40 which is an average of 00:08:23 per mile. I was very pleased with this time and it was all nicely setup for a successful week 29 with only 1 run left to do on Saturday. Saturday's run was a repeat of the first session of the week. This 11.2 mile route starts in Shotley Bridge and tackles a few tough climbs in the Derwent Valley. As a bonus the 10th mile is a nice long downhill stretch which contributed to a maximum pace of 00:06:24 per mile. I had an out of body experience at this point! The world just seemed to whizz by and I felt in complete control of my running. I'm always one for wanting to finish the week in style and this week was no exception with miles 83, 84 and 85 of the week done in 00:09:06, 00:08:34 and 00:08:28 respectively. The final time of 01:47:33 was a PB for this course. The overall average pace for the week at 00:09:04 can also be regarded as PB. If I could plot 2 lines on a graph over time, the first would be weekly mileage. That line is obviously going from the bottom left of the graph to the top right. The second line is average pace. That line is also going in the same direction. I'm expecting that trend to change soon. Surely I can't keep this pace up! It'll be interesting to see how things change when I do fewer longer runs. Anyway, I said earlier that all this maths had a point. All the while, I'm calculating and analysing the figures, trying to knock seconds off here and seconds off there. I'm trying to run further and faster and the miles seem to fly by. Before I know it and as a result of getting lost in the sums, I've ran 85 miles. It's all about distraction really! This week is not a running week so I've got a few spinning classes to get through and the small matter of a 120 mile bike ride over 2 days. That ride is from Gosforth to Bamburgh and back with Mark Fleming and a few other chaps. I hear that Mark's Aunty will be putting on a canny spread on the way back. I'm looking forward to that! The ride finishes on Saturday and then the running will start again on Sunday where 90 miles is the target for the week! Once that week is over I'll have only 2 days rest before the Blaydon Race. I'm aiming to beat last year's time of 00:51:32. If I was a betting man I reckon I'll be able to knock a minute off that time. We'll see! Sunday 17th May 2009 - 11.2 mile run, Shotley Bridge to Whittonstall and back. (01:52:20). Monday 18th May 2009 - 5 mile run, Race Course. (00:45:13). Monday 18th May 2009 - 6.3 mile run, Treadmill. (00:53:52). Tuesday 19th May 2009 - 5 mile run, Race Course. (00:43:08). Tuesday 19th May 2009 - 5 mile run, Treadmill. (00:42:19). Wednesday 20th May 2009 - 3.6 mile run, Treadmill. (00:30:36). 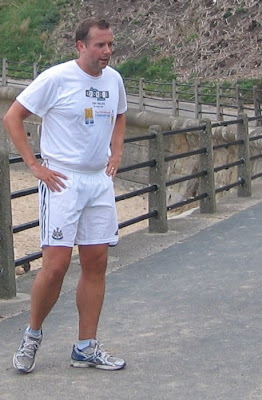 Wednesday 20th May 2009 – 7 mile run, St James Park 7. (01:03:48). Wednesday 20th May 2009 – 5 mile run, Treadmill. (00:41:18). Thursday 21st May 2009 - 5 mile run, Race Course. (00:43:30). Thursday 21st May 2009 - 5.4 mile run, Treadmill. (00:47:15). Friday 22nd May 2009 – 4 mile run, Treadmill. (00:38:39). Friday 22nd May 2009 - 5.5 mile run, Race Course Brunton extension. (00:52:26). Friday 22nd May 2009 - 5.8 mile run, Treadmill. (00:48:40). Saturday 23rd May 2009 - 11.2 mile run, Shotley Bridge to Whitenstall and back. (01:47:33). 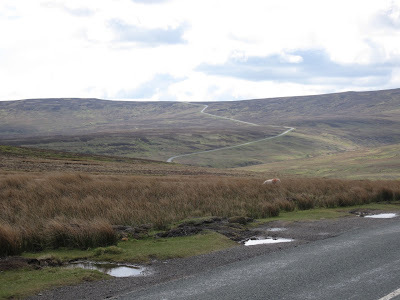 I'm pleased to report that I finished this week's training with a PB 11.2 mile run around the North Pennines. That's 85 miles in total done in the last 7 days at an average pace of 00:09:04 per mile. That average pace alone sets a new standard. 2 weeks ago the average pace for 80 miles was 00:09:30. 2 weeks prior to that the average pace for 75 miles was 00:10:07. Surely I can't keep this level of improvement going! Can I? A full review of this week's training will be done tomorrow when I've recovered. I'm pleased to report that I managed to run 10.6 miles today, over 2 sessions. This leaves just 26.5 miles left to do before the end of Saturday. Tomorrow's 15.3 miles will be done over 3 sessions. I'm aiming to get the first run of the day underway at 7 am. This will be followed by a run at lunchtime and then one after work. If I manage those runs successfully, then all that will be left to do is a repeat of last Sunday's 11.2 mile run on Saturday. I'll be trying to beat last Sunday's time of course and may well be on for the best average pace so far this campaign. Week 29 - Day 4. I managed to do 15.6 miles today over 3 sessions; 3.6, 7 and 5 miles. This leaves only 36.9 miles left to do for the target of 85 for the week. Thanks to an improved diet this week, I've found that recovery times between runs haven't been as long and I've got far fewer aches and pains than usual. It's now getting to the stage where some days all I seem to do is run, work for 3 hours, run, work for another 4 hours, then run again, tea then bed. I've even started to dream about running again! You can read all about the last time that happened by clicking here. Anyway! All of these short, sharp sessions are geared towards the Blaydon Race in 3 weeks time. Once that is out of the way, I will embark on longer runs spread over fewer sessions. According to my training schedule, I'm due to run 95 miles the week following the Blaydon Race. I haven't had a spare minute to sit down and plan those sessions yet or indeed the 90 mile week before it. The less time I've got to think about it the better! Just give me my trainers, chuck me out onto the road and I'll get on with it. So much going on behind the scenes. Apologies to regular readers for the lack of updates over the last few days. As well as working my way through 85 miles in training this week, I've spent every spare minute planning, plotting and scheming a whole host of different aspects of the run. For example, a single day hardly passes now without an hour or so being spent looking at the route across the USA. I've spent a lot of time plotting the route through the first 4 states on the run and find myself at a town called Dinosaur, Colorado. That is just one of many intriguing place names I've stumbled across to date. There are many more hours to be spent route planning. I should have quite a good appreciation of the USA by the end of it! I'm working on a number of other initiatives which will be launched over the coming weeks and months and when the time is right. More news on these, as and when I get it. My primary concern at present is being able to get a support team in place. I appreciate that it's difficult to commit to something that is 2 years away but I would appreciate it if you would get in touch if you feel you can be part of the support team. I would imagine there would be a number of support people during the 100 days, but at any one time ideally there would be 2 drivers, someone qualified in sports massage and someone to help out, entertain, motivate, cook, wash, keep the blog/Twitter/Facebook updated while I'm running. Do you fancy being a part of it all? Please get in touch at sponsorship@rungeordierun.com. Away from the organisation of the run, training is going very well so far with 32.5 miles already in the bag, leaving 52.5 to do before Sunday. This is despite a scare on Saturday when, while sprinting on the soft sand at Beach Bootcamp, I over stretched my hamstring causing a bit of pain and discomfort. The pain was quite evident during the first run of the week; an 11.2 mile hilly effort in the North Pennines on Sunday. The pace was sensible and I came through unscathed. The following day saw another cautious 5 mile run with Patrick and Carl. Not as much pain but I definitely felt as if my speed was restricted. Later on in the day, a 6.3 mile effort on the treadmill was done at a much quicker pace (00:08:38). There was hardly any pain at all after this run. I managed 2 x 5 mile runs today, deliberately striding out for sustained periods and, at the time of writing, there is no evidence that I had a pain in my hamstring at all. Happy days! I'm now faced with running a half marathon each day for the next 4 days in order to get 85 miles done. That's just like doing the Great North Run 4 days on the trot. If ever I feel the slightest lack of motivation (not very often these days!) I simply think about the 2 great charities that I'm working so hard to raise funds for. The following gives you an idea as to the services that St Benedict's Hospice and The Children's Foundation deliver to people in the North East of England. 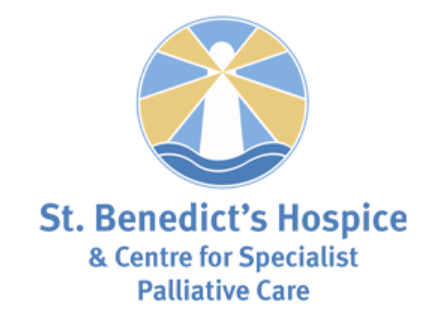 St Benedict's Hospice have recently launched an appeal for £400,000 to extend their "Hospice at Home Service". At present the service is from 9pm – 8am when the palliative care team are on call and can visit patients at home. It will be changed to 5pm – 8am avoiding an influx of calls at 9pm and will spread the visits over a longer time. This means that the patient has a choice of where they want to be cared for - in the hospice or at home and it means that they are covered 24 hours per day. Personally speaking, this service would have been of great use to me and my Mam during the days when I cared for her at home. You can read more about the aims of the Hospice at Home Service by clicking here or by visiting www.hospice.co.uk. The Children's Foundation "provides leadership and raises funds to enable research, support service delivery and create partnership programmes, designed to improve the health and well being of children and young people in the North East.". As I found out last week, there are so many amazing projects that are funded by The Children's Foundation. Here are just a couple of examples in addition to the item I posted on this site last week. Click on the following for more information; Limbs Alive, Whoops! Child Safety Project. Monday 11th May - Personal Training Session. (01:30:00). Thursday 14th May - Personal Training Session. (01:30:00). Saturday 16th May - Beach Bootcamp. (00:45:00). Saturday 16th May - 5 x run up the steps. (00:22:13). In the presence of a true Geordie legend. I was very lucky this week to be invited to the Children's Foundation AGM where I was able to get an insight into some of the projects they currently undertake and support. I was quite overwhelmed and humbled by the whole thing. They strike me as a very innovative charity and one of the projects talked about was concerned with using 3D technology as a distraction for children receiving medical treatment. I believe use of this technology in the burns unit is only a month or so away. There was also mention of the Great North Children's Hospital. I reckon that in years to come, it will be regarded in our region as highly as Great Ormond Street Hospital is in the south. The building design is brilliant and I'm sure it will be as iconic as other North East landmarks such as the Tyne Bridges, The Angel of the North and the Sage Gateshead. Finally, there was a most fascinating talk given by Paralympian Stephen Miller (pictured). Stephen has competed in 4 Paralympic Games, 3 World Championships and 2 European Championships to date winning a whole host of medals including a Silver in Beijing. I was very proud to hear that he was born in Princess Mary's hospital albeit some 9 years after me! Stephen talked about his time growing up and the support he received from his family. To say that it was an honour and a privilege to get such an insight into Stephen's life and achievements is an absolute understatement. What a true Geordie Legend! 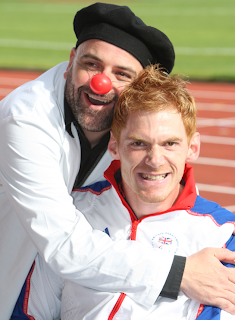 I wish Stephen every success in the build up to London 2012. What will you be doing in 2 years time? What will you be doing on this day in 2 years time? If all goes to plan, I will have reached Las Vegas on Day 10 of the run from California to New York. That brings me nicely on to the photo to the right where my mentor and trainer Mark Fleming and his Fiancee, Sharon Burgess recently got engaged. I'd like to say that Mark is pictured here popping the question wearing his Run Geordie Run t-shirt but I believe the "deed" was done after watching the fountain show outside the Bellagio Hotel. A hearty congratulations to them both. And that brings me nicely onto a reminder that you too can pop the question in a Run Geordie Run t-shirt. I can't help you out with the engagement ring but I am able to offer Run Geordie Run t-shirts in all sizes from Small to XXL. 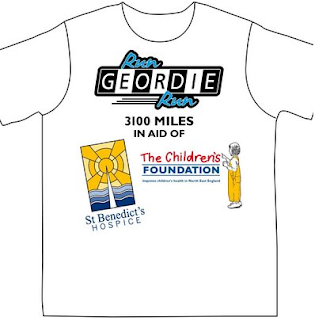 If you would like a t-shirt then please drop me a line at sponsorship@rungeordierun.com. T-shirts are priced at £10. Thanks to Peter McCowie for paying the production costs, the full £10 goes to St Benedict's Hospice or The Children's Foundation. The t-shirts are screen printed for durability and feature the Run Geordie Run logo as well as those of the 2 charities. The details of the 3100 mile run are on the back of the t-shirt. All in all it's a cracking bit of kit to wear to the gym or just to knock around the doors in while supporting 2 excellent local charities. As an added incentive, all buyers of a t-shirt can submit a photo of themselves to sponsorship@rungeordierun.com (like the one above) wearing the t-shirt in an exotic or unusual place. In September 2009, I'll ask the Run Geordie Run Facebook group members to judge the best one. The winner will receive a prize as well as my thanks for buying a t-shirt and making a valuable contribution to 2 great local causes. 80 miles done in week 27. What a great week! Despite having a rest day during week 27, I still managed to get all 80 miles done. Yesterday's 10.4 mile run in the North Pennines was done in even worse conditions than last Sunday. I didn't think it could get any worse! That wind just seems to get stronger every week! To keep me on my toes, I decided to race against myself from last Sunday's run using the Virtual Training Partner feature on my GPS watch. I was never really aware of the time or distance on any part of the run, just how far ahead or behind I was. On the way out, the wind was constantly in my face and a downpour of rain made the whole route quite unpleasant to run in. It was no surprise that once I got to the half way point I was 1/2 mile behind my virtual self from last week. There had been absolutely no let up in the wind but I did hope to use it to my advantage on the way back where I knew it would be behind me. It took me until 1 mile from the end to overtake my virtual self. That was mile 76 for the week! I can't say how overjoyed I was at this point knowing that I'd managed to put in as good a performance at the end of a tough week as I had at the start. The last 1.4 miles were a formality and I reached the ford at Stanhope in 01:54:34. This was over a minute quicker than last week. Later on in the day, I did a slow 3 mile run on the treadmill. This had the desired effect of leaving very few aches and pains in my legs today. That 3 miles brought the total for the week nicely to 80. That's a new landmark in training for me but still 30 miles off where I need to be running by the Summer. So that was week 27. Next week I will be spending some time in the gym with Mark Fleming, doing a few spinning classes and running about 20 or so miles if I can find the time. The following week I'll be having a go at running 85 miles. At the time of writing, I feel that I have a good chance of succeeding. Confidence levels are high but the desire to improve and run even further and faster is even higher. Sunday 3rd May - 10.4 mile run, Stanhope to Summit and back. (01:55:47). Tuesday 5th May - 4 mile run, Treadmill. (00:34:52). Tuesday 5th May - 5 mile run, Race Course. (00:44:47). Tuesday 5th May - 4 mile run, Treadmill. (00:37:12). Wednesday 6th May - 4.5 mile run, Treadmill. (00:36:26). Wednesday 6th May - 5 mile run, Race Course. (00:42:31). Thursday 7th May - 6 mile run, Treadmill. (00:50:43). Thursday 7th May - 6.2 mile run, Colin Moore's University Route. (00:52:34). Thursday 7th May - 6.2 mile run, Treadmill. (00:55:42). Friday 8th May - 4.5 mile run, Treadmill. (00:42:45). Friday 8th May - 8 mile run, Treadmill. (01:14:26). Friday 8th May - 2.8 mile run, Shotley Bridge out and back. (00:24:05). Saturday 9th May - 10.4 mile run, Stanhope to Summit and back. (01:54:34). Saturday 9th May -3 mile run, Treadmill. (00:36:06). Getting better and better in week 27! Well then! It's all set up just nicely for a successful 80 mile week. Yes 80 miles! That will be a new record for me in training if I am successful. I'm quietly confident though. In fact, I'm very very confident. Confidence levels are sky high at the moment following probably the best week of training I've had so far during this campaign. There have been 66.6 miles done so far since Sunday. Don't forget that I didn't do any running at all on Bank Holiday Monday so that mileage has been done in 5 days not 6. That rest day really put me on the back foot this week but I have responded and responded well. After Sunday's 10.4, I managed 13 on Tuesday, 9.5 on Wednesday, 18.4 on Thursday and 15.3 today. The average pace for this week has been 00:09:09 per mile. Take Sunday's slow hilly run out of the equation and you get 00:08:50 per mile. Take either of those numbers and it's still the fastest average pace I've managed during this campaign. When I get the chance, I'll be including weighted averages in my stats to give a fairer indication of pace based on the different length of runs I do each week. For now though, two things are clear. I'm running further than ever before in training and I'm running faster than ever before. Not only that, but the main principle on which my schedule is built is almost a foregone conclusion these days. i.e. NO REST, NO RECOVERY. This has certainly been put to the test this week with 12 runs done at a consistent pace with hardly any time to draw breath in between. Nice! Tomorrow, is the final day of training for this week and all I have to do to bring this baby home is a repeat of last Sunday's tough 10.4 mile run in the Pennines followed by a warm down 3 mile run later in the day. I'll just be happy to get all of the mileage done but I will have one eye on the clock as I look to ensure that this is not only the best week yet in terms of distance but in time too. Pictured above is the 2nd climb on the run taken from the top of the 1st climb. The forecast suggests that it will be cold and wet in that part of the North Pennines tomorrow morning. I think it will be a 3 layer job with the highest tempo dance music I can find on my iPod. Gosh! Is that the time! Right, I'm off to dream of 1860 ft worth of climbs that await in the morning. That would have been a nightmare for me in the past. But not these days! On target for 80 miles in week 27? After Sunday's very difficult run, I never managed to get out on Monday. Oops! It was important, therefore, that at least 13 miles were done today. I'm pleased to report that I managed a 4, 5 and 4 mile run all at a reasonable pace. In fact, the 5 mile run at lunchtime round the Race Course felt so easy compared to Sunday's hills session. And it was windy apparently. It was a small trickle of a breeze compared to the gusts in the Pennines on Sunday. Now I'm left with 14.1 miles to do each day for the next 4 days in order to reach the required 80 mile target. If I keep to the 00:08:30 - 00:09:00 minute mile pace that I did today then I've got a decent chance of success. This is my first attempt at creating a video for the blog. This was Sunday's 10.4 mile run from Stanhope to "The Summit" and back. I hope to have many video posts during the run across the USA in 2011. I'll be trying to improve my on-screen technique between now and then. This isn't too bad for starters! Is it? Any comments would be most welcome to sponsorship@rungeordierun.com. Friday 1st May - Spinning. (00:45:00). Saturday 2nd May - Beach Bootcamp. (00:45:00). Saturday 2nd May - 10 x run up the steps. 80 miles, here we come! I must admit that anticipating the start of my running week a day earlier than usual is a little bit strange. The USA 2011 training schedule is 6 months down the line now and is close to being like a well oiled machine! The beginning of the training week has been a Monday all of that time. As of this week, though, the start of the week is Sunday. It may sound trivial but I can see already how it is going to make a big difference to my training. I have alternated between a week of running followed by a week in the gym followed by a week of running and so on..... The slightest change to that routine gives the week a totally different complex and I'm looking forward to being able to get out into the Pennines on day 1 tomorrow with fresh legs. Or as fresh as they can be after today's very tough Beach Bootcamp. Is it just me or is David Fairlamb making the session tougher each week lately? That's not a complaint by the way! The tide was in at Tynemouth Beach this morning which meant that the majority of the session was done on soft sand! Ouch! Tomorrow's run will see me start at Stanhope Ford, run 5 very hilly miles south on the B6278 before heading back again. The summit of the run and 5 mile point is pictured. The total overall ascent for this run will be approximately 1860 ft which will be quite a challenge. The forecast doesn't look too bad for tomorrow and hopefully the wind isn't going to be anywhere near as bad as last week. I'm going to try and post a video entry on the blog tomorrow. It may or may not work out but it could be the first of many if all goes to plan. I think for many readers, putting faces and places to names will be a nice change and hopefully it will attract a few more readers of this site. In the meantime, tomorrow's run will hopefully get this week of to a good start as I attempt to run 80 miles over the next 7 days. I'll hopefully, be updating the blog daily to keep you posted with progress. Also, there is a lot of research and organising currently being done behind the scenes. The USA run starts in 2 years time this Monday. I'll be monitoring and recording the weather conditions at the corresponding place that I'll be on the actual run each day from Monday and the following 100 days. I'm also looking into Visa requirements, accommodation, attracting corporate sponsorship, budgets, funding etc etc etc. It's fair to say that it's all go at the minute! Raising Tour Funds on ebay! It's been a while since I've used eBay to try and raise a further few bob towards funding the USA 2011 tour. Over the coming weeks I'll be adding some great items from my personal collection. Up for grabs today is this rather unique TEAM GB FLEECE from the BEIJING 2008 OLYMPIC GAMES. This item wasn't available in the shops and has a starting price of £50. Watch out for further rare items coming soon. To view the full list of rungeordierun items, please click the ebay logo further down the page.